They’re also something that needs to be part of your company culture. Process adherence is the culture side of systemization, and that makes it one of those hard to grasp concepts without many solid rules. The culture of processes — instead of the act of writing and optimizing them — is something we’ve been meaning to cover for a while because we know it’s a big problem for our users. “[Process adherence] is something I’ve been dealing with since I started formally creating documentation in ’83. It really must start at the top level where they don’t answer questions, they ask if it is “in the manual” and it ripples down. 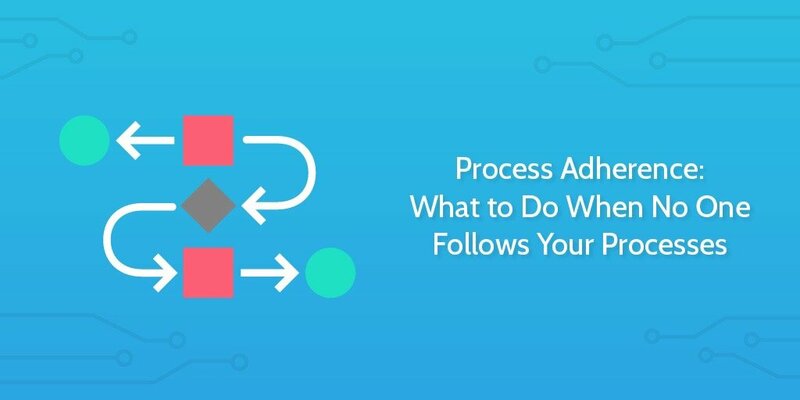 In this post, I’m going to explain why processes fail because of human nature, and then unpack each reason with an explanation of how you can improve process adherence in each area. It’s a common misconception that processes are counter-productive. The real productivity killer is when a team doesn’t know what they’re doing, or who’s responsible for it. In cases like this, teams will develop their own informal versions of processes in their heads in a phenomenon known as the normalization of deviance. In an ideal world, every process would be formalized and optimized, and everyone would follow it to the letter. In reality, that’s a rare thing. It’s the companies that realize how important it is that succeed. And so, in this post, I’m going to share knowledge and resources from process experts to help you nail down your business systems and start seeing real results out of that dusty old binder full processes no one looks at. 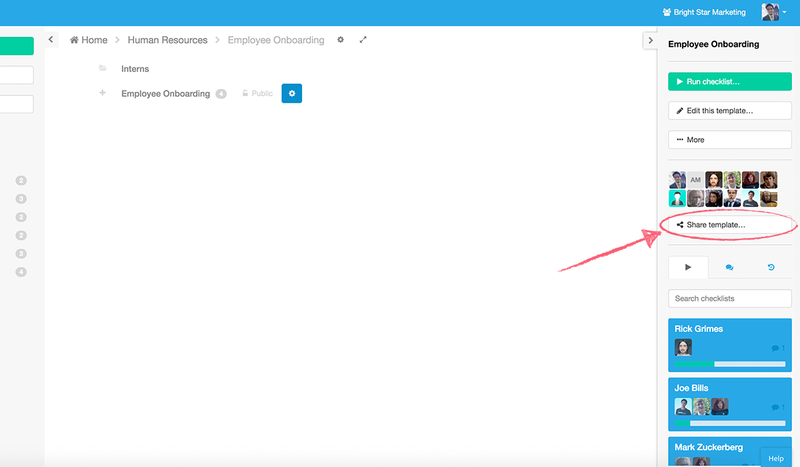 To make it even easier, you can bake processes into whatever system your employees spend their time in. 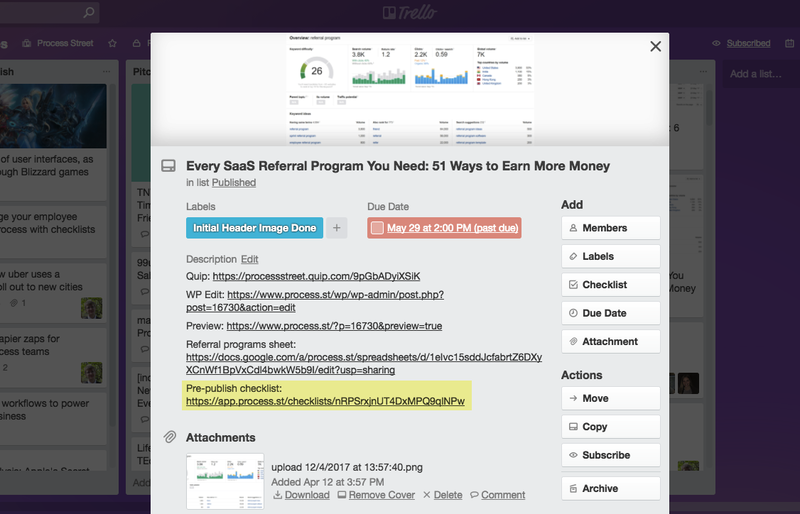 We use a Slack post inside our content creation group full of URLs to the processes we might need, just because it’s easiest to work inside the app you’re used to using, instead of changing apps all the time. If processes aren’t easy to actually use, they’re going to be hard to adhere to. As I pointed out in a previous article on using emoji in processes, Trustologie CEO Marie-Claire Ross says that 95% of processes are difficult to read. One (slightly off-the-wall) solution I suggested in that article was to use a creative range of emoji as ways to make processes scannable and more visually appealing. Although, that solution isn’t ever so useful if your processes are incomprehensible in the first place. 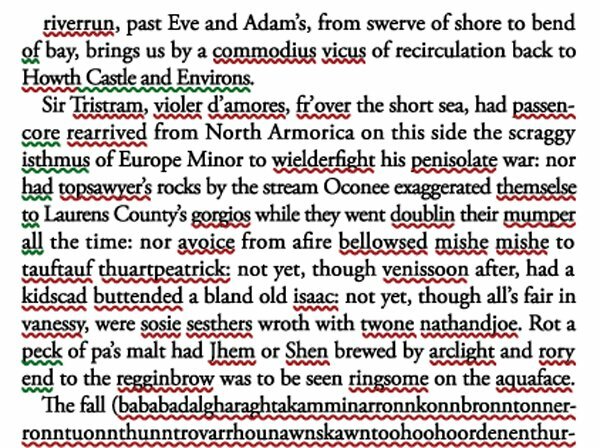 Don’t James Joyce your processes. Use an imperative at the start of each of instruction (turn your computer on, send the report to the marketing manager). Break complex tasks down into bullet points to avoid blocks of text. Use graphics, flow charts, videos and photos to make the instructions as clear as possible. For an example, see our XYZ template. Above are just a few key pointers that will make your processes easier to use. As a manager, it’s your responsibility to make sure that your team is able to do their job properly. That means going through the process personally with an employee and either figuring out where it’s breaking down or making sure they are completely familiar with it. Don’t spoonfeed information off-hand; direct your team to the processes, and be there if they need extra explanation. Also, consider that if a process needs repeatedly explaining, it might be an issue with the process itself. One interesting thing to note is how important it is that a manager stays in the loop with how their team is working and is available to offer help with processes. The more people that learn the process properly, the less you’ll find misinformation seeping into the commonly accepted ways to get work done. A process champion (or any other title you want to use) is someone responsible for checking process adherence, managing the business processes, and checking in with teams using processes to make sure they’re not running into any issues. In a small company, this could be just one duty of each team leader. Bigger organizations have been known to appoint a staff member with the sole role of enforcing processes — Promapp call this their Process Bulldog. Major cultural changes in organizations work better when there’s an individual made accountable instead of just an unenforced change in policy. 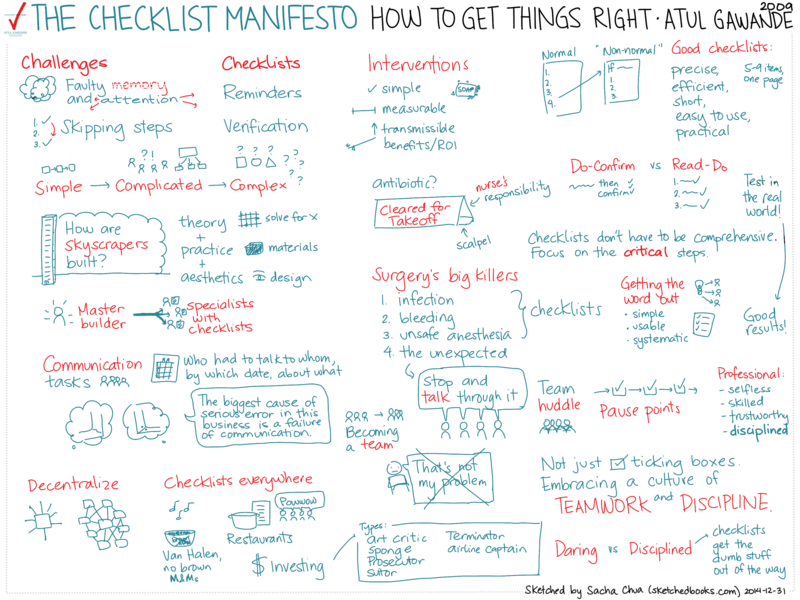 We’re massive fans of The Checklist Manifesto at Process Street. If you haven’t read it, you can check out a full summary here. In short, the book is a case study of a doctor implementing a checklist in the operating theater to reduce human error. He knew the fault wasn’t that all surgeons are incompetent, so he sought to make sure that the proper processes were in place and that they were being followed. The results were quite startling: 78% of staff using the observed the checklist preventing a mistake in the operating theater. Does the process not have a step that asks the participant to check broken links? Is the process simply not being followed closely / at all? The last question is easy to check. Our BPM software, Process Street, logs process activity and gives managers an easy way to see who is doing what. An out of date process can make the difference between a useful document that skyrockets your business efficiency and a misleading source of pesky mistakes. You could choose to tackle process updates by regularly auditing your team’s processes, but it’s better to make updating processes a task for the process participant every time the way you do the work changes (e.g. when you change the software you use, or when team structure changes). Process Street makes it easy to keep processes up to date because everything is hosted online. Making changes to the master document affects the process everyone will see, so there’s no disconnect between those who have the old and new copies of the process. Also, updating a process template lets you make automatically make updates to every active process, too. That means you don’t need to worry about work-in-progress tasks getting executed incorrectly. Since we develop process software, it won’t come as a surprise that we live and breath processes. Thankfully, Process Street has its own mechanisms built in to help managers ensure their team is following procedure. As a manager, you need a way to check directly if a task has been completed to the specifications laid out in its process. It’s especially important if a process breaks down; if the process really has been followed to the letter, then there must be something wrong with the process. I’ll explain. We manage all of our pending blog articles and ideas inside a Trello board. 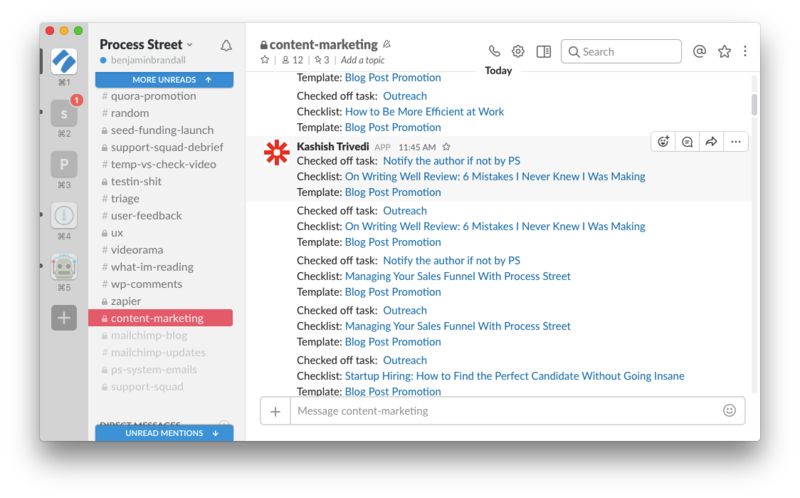 To centralize information (which is an important part of building a scalable business), we put all relevant links inside the respective blog post’s Trello card. That includes a link to the pre-publish checklist, which is a process we use to make sure our blog posts are keyword optimized, error-free, and submitted for approval. Other than ensuring consistency for our blog, it also ensures process compliance accountability for the writers and editors. If the link to the process isn’t there, it’s assumed it hasn’t been completed and can’t be submitted. This helps you keep track of your processes, and can also be routed through Zapier to send these notifications to other apps like Slack. Alternatively, we also integrate with Slack to feed Process Street notifications wherever they need to go. The same way that a task never gets done if it doesn’t have a deadline, a process won’t be completed if it doesn’t explicitly state who is responsible for it. With Process Street, you can assign members (individuals and groups) to tasks and templates, so everyone will know who is accountable for execution. 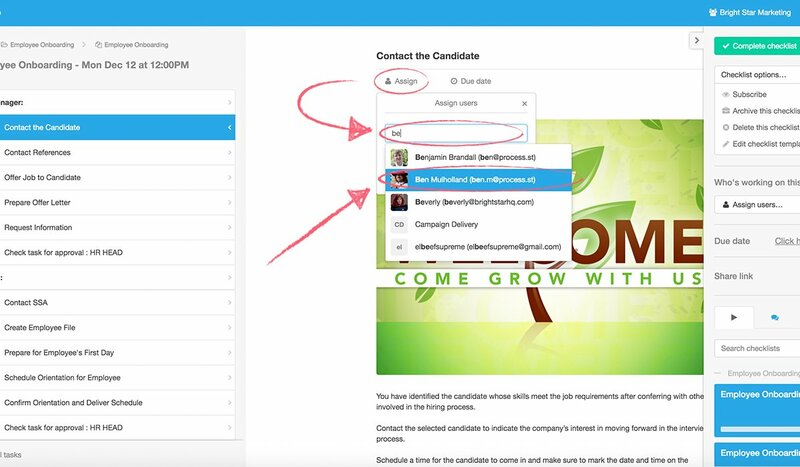 By clicking ‘Share template’, you can add email addresses of your team to the template. 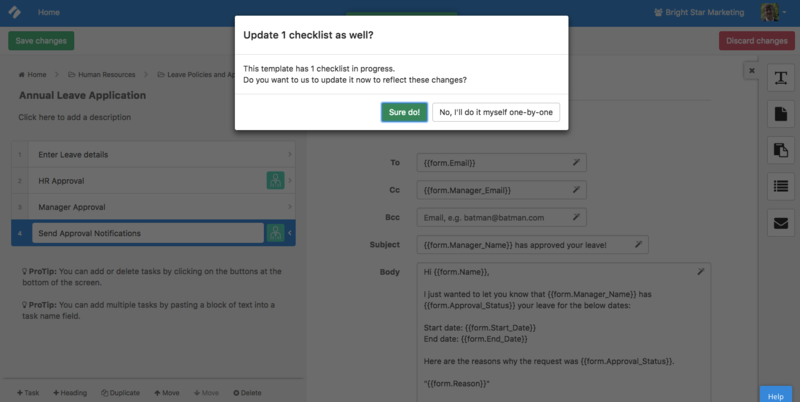 Alternatively, you can assign specific tasks from inside templates. This shows us each instance of a process run, along with the assignees, task status, due date, and more. Instead of manually checking in on the status of tasks, we just check the template overview and get detailed, filterable information instantly. Writing, deploying, and even optimizing processes is likely to be an easier task than actually getting people to use them. This is especially true in larger organizations where all change needs buy-in from leadership. However, I hope this article has helped you get on the right track towards building a process-driven business that cuts human error from its operations. Totally agree! Availability and easy to understand a process list is the key to make it happen! Thanks for commenting, Jordan. Glad you liked the article. one reason i have only moved partially to process st is because it doesn’t have ability to use search to find a process. currently you essentially have to know where it is to find it. so currently i document most things in google docs and the big processes important to the business that need structure go in process st. hopefully the doc feature will be there soon. Searching the name of a user in your organization will also bring up every item they are assigned to – for example, you could search your own name to bring up a checklist you’re assigned to and need to work on.